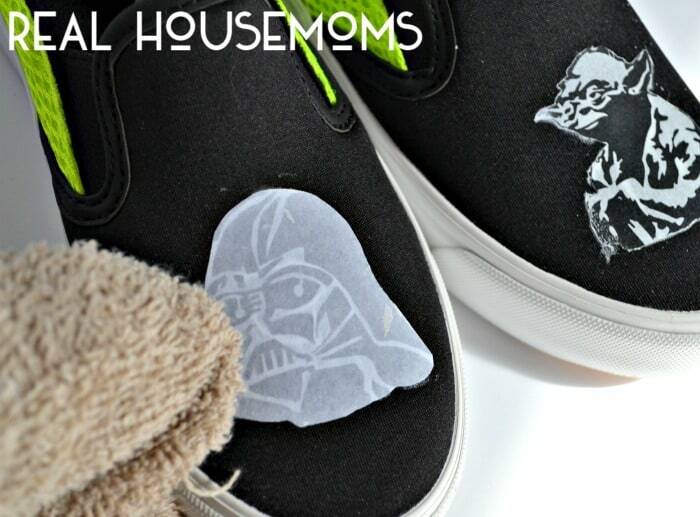 No matter if you’re a Jedi or a Sith, these DIY STAR WARS TENNIS SHOES are one with the force! 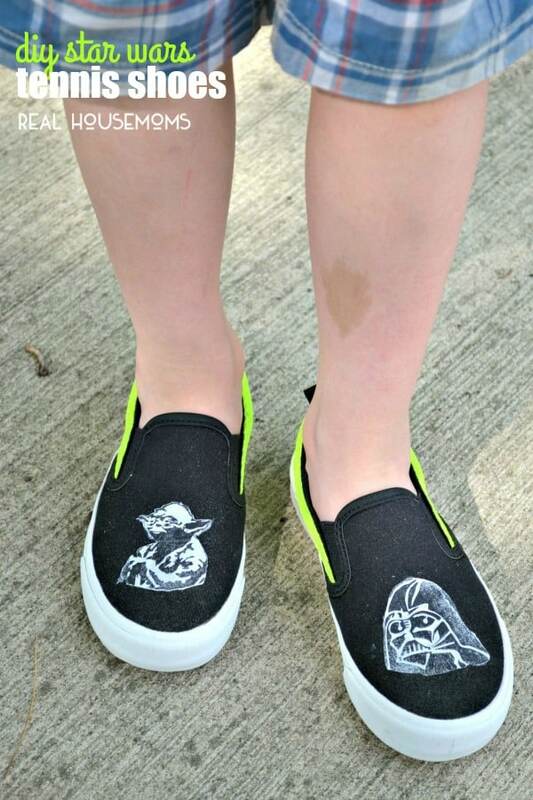 My son is in LOVE with Star Wars these days…and I recently came across a way to personalize a simple pair of black slips ons and turn them from the Dark Side into something even Yoda would be proud of!! All it takes is a simple laser printer print of your favorite characters, mod podge photo transfer medium, and a paint brush!! 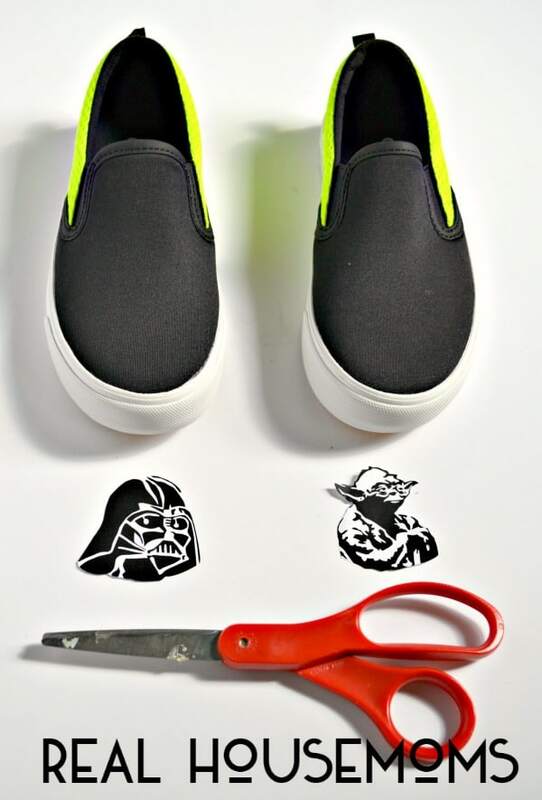 Let’s see how easy it is to make your own Star Wars tennis shoes! Start by finding your logo/character clip art online. I google image searched Star Wars Clip Art and came across a few images I liked. I saved them to my computer and then added them into a Microsoft Word document. From there, I resized them down to about 2″ x 2″ and printed them off on white office paper. It’s IMPERATIVE that you use a laser printer for these images or it will not work. If you have a photo, it will have to be printed off on your printer or on a photo copier to make this work. After I had my logos, I got my scissors out and cut around all the edges to get a nice clean line. 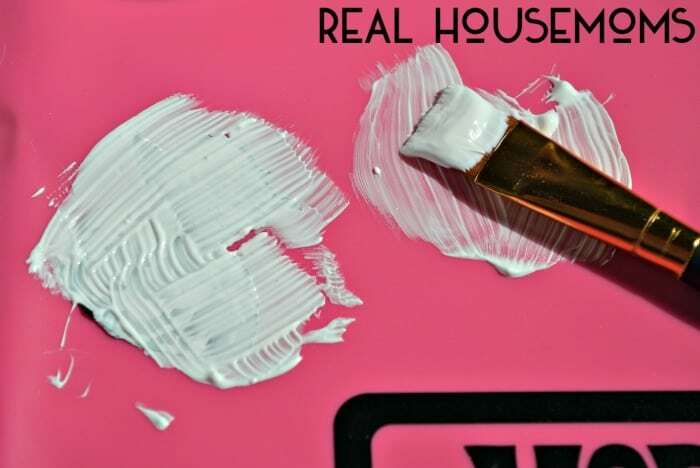 Any white you leave or uneven edges WILL show on your final result, so take your time. Next, I took my mod podge and brush and on my mat I added a very thick layer of mod podge directly onto the top of the image. 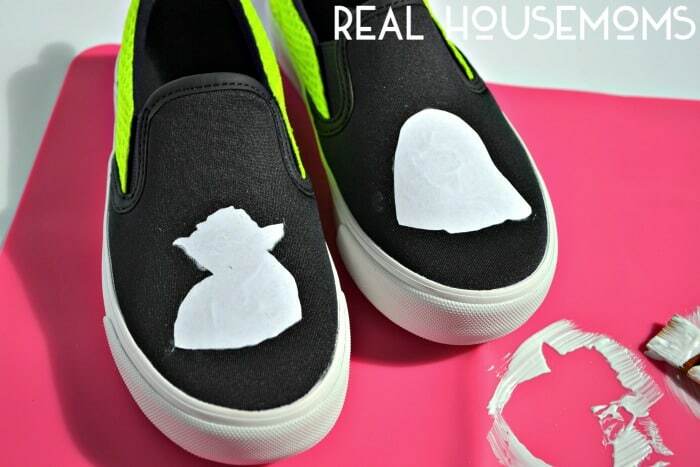 Lather it on well so that the image is barely showing through, then place the image face down onto the shoe. It’s important to note here that if you’re using words, you will have to flip the image so that the words read the right direction. After you place your image face down, gently rub out any air bubbles and wipe off any excess mod podge from the sides. Next…you have to wait. You must wait a FULL 24 hours for this to dry…not 12, not 18, 24. So sit back and relax and set your project aside til the next day. Now that you’ve waited 24 hours, take a damp rag and gently start rubbing the paper off on your image. You may think you have it all and then once it dries you still see some film, gently rub until only the image is left on the shoe! Now enjoy! 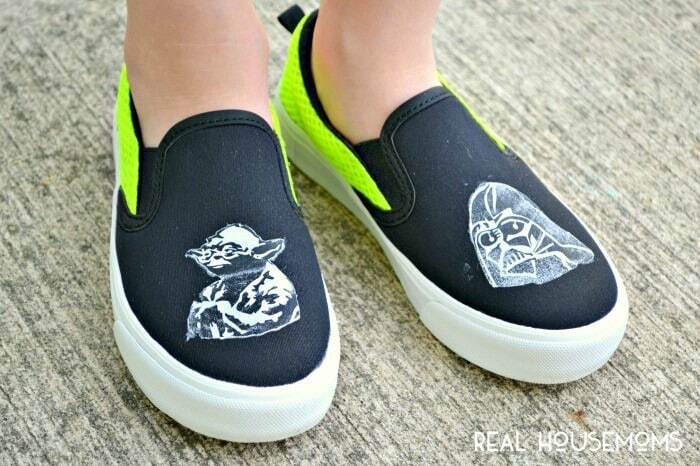 You just made your own Star Wars shoes for a fraction of the price!! I have so many fun plans for this product…personalized shoes, bags, pillows, and more!! You can stop by my blog, The Cards We Drew, to see more fun craft and recipe ideas!!! Great post, just what I needed. I do not know how to make my tennis shoes stand out. So I have been wondering what to do… so it is nice to find out that I can have beautiful shoes. Thanks for a great blog, I am a big fan. 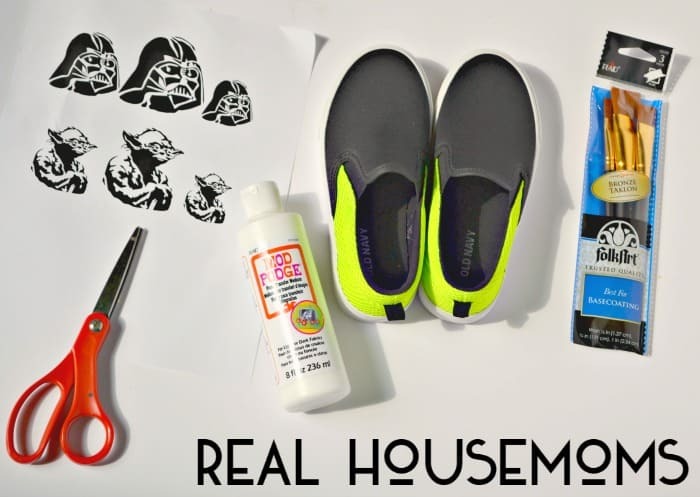 My daughter is a star wars fan and to think that we could do this DIY star wars-themed shoes from our tennis shoes! Great read though. I’d definitely do this and hope that the result would be the same as yours. Keep sharing! They will turn out great!